Medieval armor meets high fashion in the meticulous work of It Is Known. 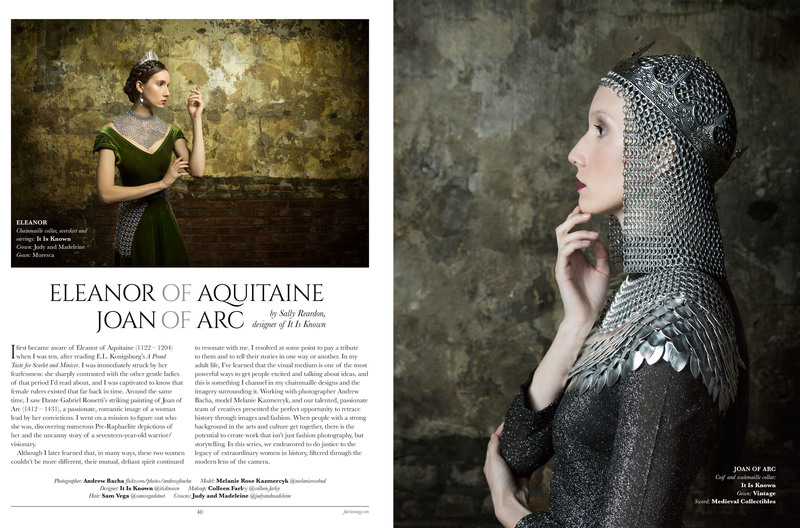 They specialize in wearable art made of “scalemaille”—small, leaf-shaped metal components individually linked by hand in their atelier in New York. I’ve been fascinated by their creations and stunning photoshoots ever since one of their spaulders popped up on my Instagram feed. Of course, I then proceeded to lose myself down the rabbit hole of the entire @ItIsKnown IG page! 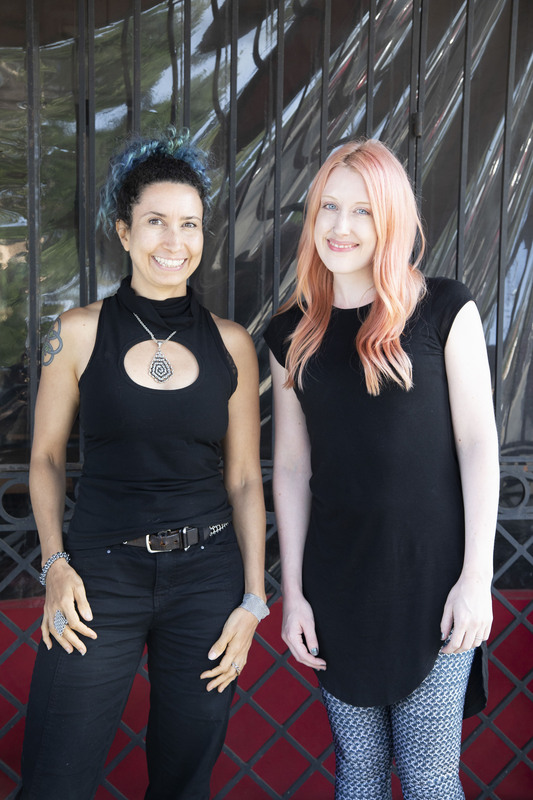 Find out more about It Is Known’s founder and designer Sally R. in this edition of Blue Buddha’s Meet the Artist series. Enjoy getting to know Sally below! Thanks for taking some time to let us get to know you, Sally! First off – how did you come up with the name for your business? How did you get started with chainmaille/scalemaille? “Mesh and Rosettes” necklace—Sally’s first chainmaille piece. Photo by Austin Hill. I started making chainmaille on a whim. In 2015, I was in the midst of preparing for a big trip to Castle Burg Finstergrun in Austria. Fantasy/high-concept formalwear is a big part of the event, and I decided to make some chainmaille accessories by following the “Mesh and Rosettes” tutorial from Blue Buddha Boutique. The tutorial instilled so much confidence in me that I enthusiastically began to make a scalemaille panel corset to go with it, figuring I would teach myself scalemaille using The Ring Lord tutorials and YouTube in the few weeks before the trip. Since I had experience making corsets, I figured this would be easy (which, in retrospect, is funny and a cliché)! 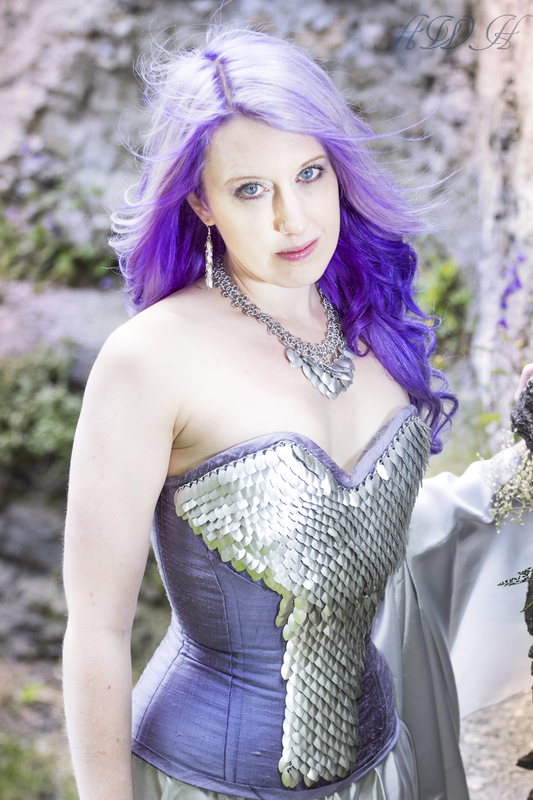 I almost had to eat my words, but I did finish the project―a handmade corset, 3,000+ scales in the front panel and all―24 hours before my flight, and gained some humility in terms of the intricacies of chainmaille. My fiancée, Austin, professionally photographed my projects and I shared the images online. In September of the same year, a photographer contacted me to make him a custom “Red Sonja” style bikini set, based on corset and necklace projects I posted online. I spent about 6 weeks constructing the bra and skirt prototypes, and, again, my fiancée photographed them. 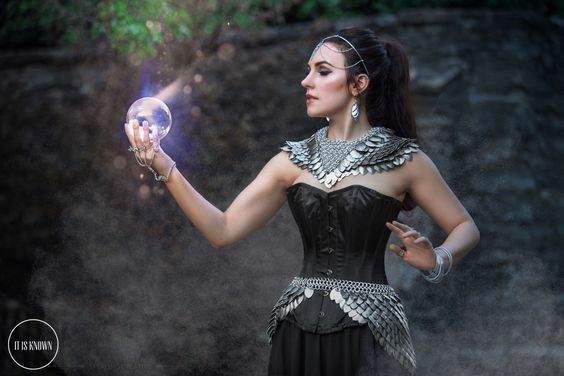 The photographer was happy with my work and photographed the pieces extensively, and from there on out I fell in love with chainmaille, spending a great deal of my free time prototyping women’s wear on my dress form and envisioning new styles. I soft-launched It Is Known in late 2015 on Etsy―just a few spaulder styles and my bikini design―and things evolved from there into the current line of offerings. When I officially launched It Is Known in 2015, I decided to focus on women’s clothing and large-format accessories, primarily scalemaille with chainmaille accents. I chose to focus on that area because I already had experience with apparel design (flat pattern design/draping/stitching), so it made the most sense to do I already was drawn to. I also noticed that while there were established artists offering custom chainmaille on an individually-commissioned basis, fewer artists were offering prêt-à-porter or semi-custom designs with clear prices. I thought a selection of prêt-à-porter maille clothing and large accessories, beautifully photographed, had the potential to excite a different sort of customer, one who would otherwise think of chainmaille as only for Renaissance Faires, be intimidated by the custom commission/quoting process, or be unfamiliar with chainmaille’s potential as a medium. 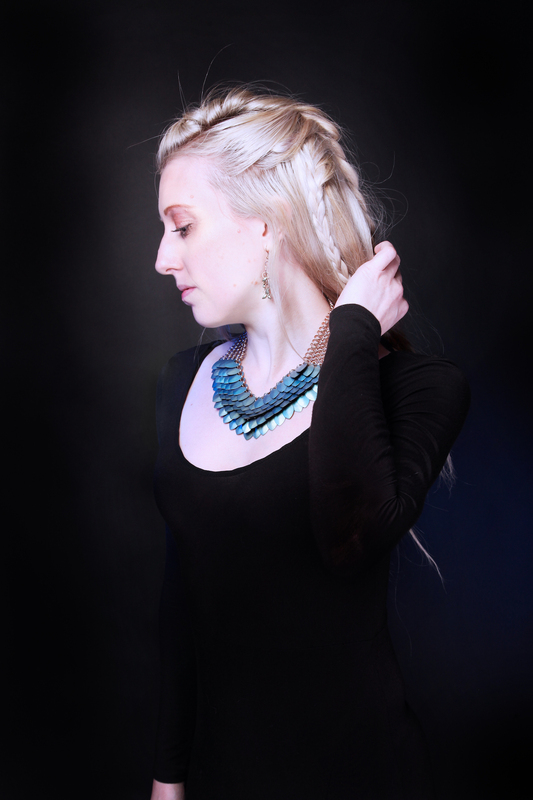 I was also really interested in having the photos of my work be as beautiful as possible: I am on a bit of a perpetual quest to get an Internet audience to see chainmaille clothing/accessories in the way that the people who make it see it―as wearable art. Since I started It Is Known in 2015, I’ve produced two fashion shows, added quite a few publishing credits to my name (the one for Faerie Magazine was a favorite as I wrote an article for them, too), worked several film projects (recently Ocean’s Eight), and learned a lot in the process. A few things have changed: I started working with another, very talented artist, Dan of Forge and Fleece on select projects and wholesale orders. That’s been a nurturing and rewarding partnership―Dan is such a talented and seasoned artist who is professional, kind, and generous with his knowledge. I’ve also expanded the product line beyond womenswear and began to develop some designs for men and unisex products. So far, quite a few people have been interested in the male and unisex line, so I’m looking to expand it even further. I’ve also had the opportunity to commission or collaborate with some other creatives (designers, models, photographers, etc) that I profoundly respect, and my own work is the better for it. I really can’t say enough about how much making art is a collaborative effort for me, and how enriching it is to work with other artists. Your photos with models are amazing. Can you talk a bit about what’s involved with a professional photo shoot? Thank you so much! I’m excited to say more about that. In recent years I’ve realized that shoot coordination and creative direction is as much a part of what I do as chainmaille, so I lean into that in my business model. In my mind, the most successful shoots are the ones that involve a great team—in addition to the model and the photographer, a hair stylist, makeup artist, assistants, etc—whatever the project requires to fully realize the intended outcome. As such, I spend quite a bit of pre-shoot prep time sourcing coordinating wardrobe/doing pulls, developing the concept or negotiating it with the other creatives, making moodboards, location scouting, etc. When organizing a photoshoot myself, I like to take a hands-on approach so that I know everything fits well and coordinates. On the day of the shoot, it’s important to me that other members of the crew feel respected and comfortable—my work is often nearly done by the time I arrive on set, so I want to make sure that they have the space to do theirs. The other sorts of photoshoots I do are rentals and pulls. 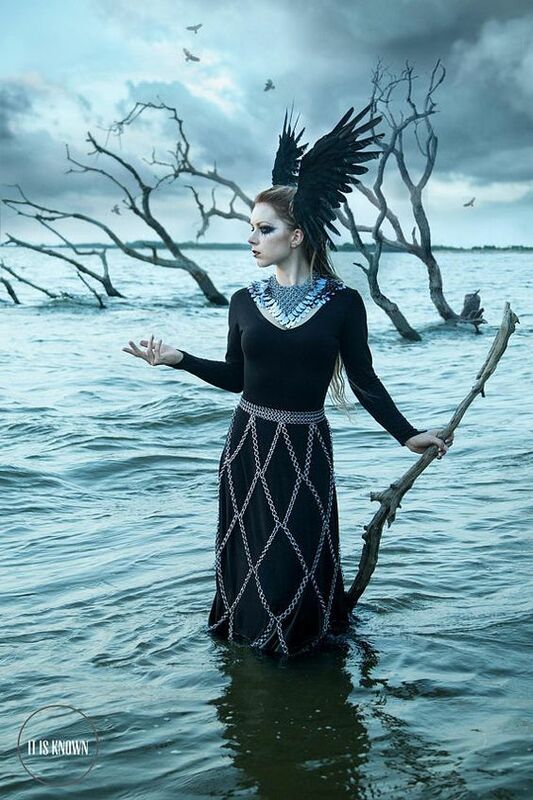 Since I know how much work goes into creative direction and wardrobe styling, it can feel like “magic” when those clients are kind enough to circle back with images! Although professional photoshoots require an investment of time and money, I think the results are worth it. I’m inspired by seeing other professionals execute their art in real-time, and I learn something new every time I shoot. The imagery of the Pre-Raphelite brotherhood is a huge source of inspiration for me. On the flip side, I’m also drawn to the art of H.R. Giger and the bold lines of M.C. Escher—I’m drawn to imagery that’s either very hard, cold, and biomechanical or warm, natural, and classically feminine. In terms of photography, the concepts behind Tim Walker’s work as well as his technical skill represent a creative zenith for me: I never get tired of looking at his images. Do you pay attention to fashion trends? If so, how do you stay on top of them and put them to use in your work? If you disregard trends, why? I pay attention to movements and trends in culture (and popular culture) more than fashion trends—understanding the current landscape in film, television, emerging ideas/schools of thought, literature and research and in subcultures around the world can serve any artist interpersonally as well as creatively. At the same time, I also spend a great deal of time reading and absorbing media that fit my values and aesthetics to hone the style of my work and improve my craftsmanship/design. When it comes to the design process (work in the private sphere), I strive to create work that I find personally beautiful, but when it comes to the business aspect (my work in the public sphere), I’m interested in discovering what speaks to other people and how my designs fit into their frame of reference. Imagery is a special medium in that it can communicate ideas without words—someone halfway around the world can see your pieces, feel connected to them, and appreciate them without even needing to know the same language. That’s powerful to me. On the technical side, the feedback loop between designer and customer helps me improve first-generation designs: if I discover something that will make a design a bit better (in terms of quality, design, fit, cost), I will tweak the next piece I make or release a more refined version. I do pay attention to shifts and changes in fashion trends while also understanding that my goal as an artist is to have a recognizable style that satisfies me. I work with all kinds of people, and about 1/3 of my work is custom or semi-custom. Since my designs are statement pieces, the majority of my individual customers are shopping for an event or an occasion. A lot of my customers are from the Renaissance Faire, Pride, Burning Man and music festival circuit, (and Halloween of course) as well as attendees of Goth and alternative events. I also do wholesale projects and commissions for film/TV and photoshoots—those are fun, especially when I don’t have to wait over a year before talking about a project! When it comes to custom work for individual clients, I feel honored when people feel comfortable letting me know about the story behind their commission, and trust me to treat an “unusual” request with sensitivity and intelligence. Seeing my work enjoyed in person or worn in photos is the best feeling, whether it’s a “high-profile” project or an individual—I never get tired of that. My daily personal style could be described as “minimal color, maximal cut.” I wear a lot of black and solid colors, but I like clothes with striking cuts and interesting design details. My event and eveningwear is a bit more fantastical and colorful, and my hair has been blonde, ombre purple, rose gold, peach, etc. I like to buy from other independent designers or go to sample sales in NYC—the quality tends to be better than fast fashion, and the supply chain tends to be more transparent. In terms of well-known designers, Alexander McQueen (R.I.P.) is a personal inspiration. A long-term goal of mine (perhaps ten years on—after all, this is a big project!) 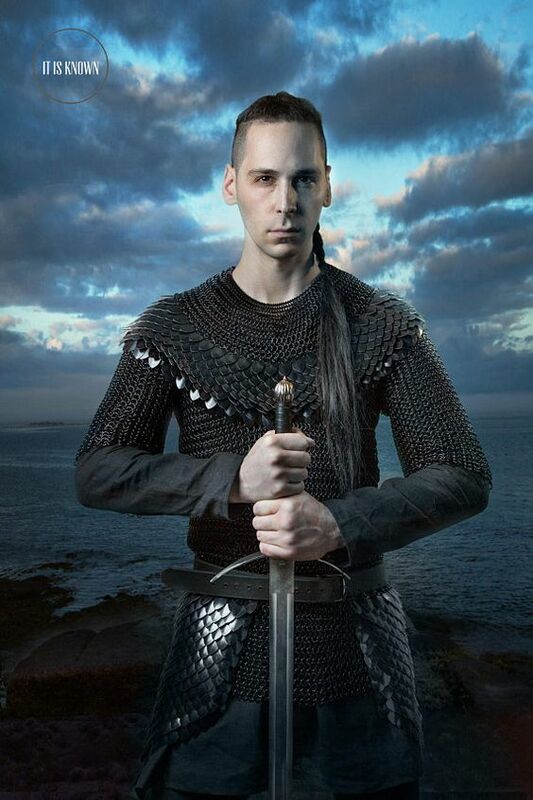 is to compile a book of patterns for scalemaille and chainmaille clothing, and to apply the concepts of pattern grading (from fabric/conventional apparel design) to chainmaille clothing. I’m very passionate about documentation, and I’d love to pass something on to the chainmaille community. Oooo! That would be a great resource for the community! My “favorite” design tends to change every few months. Right now I’m very excited about this Romanov weave harness I made—it was time-consuming, but I’m really pleased with how it turned out. I think I’ll do a sister piece based off it in darker tones! 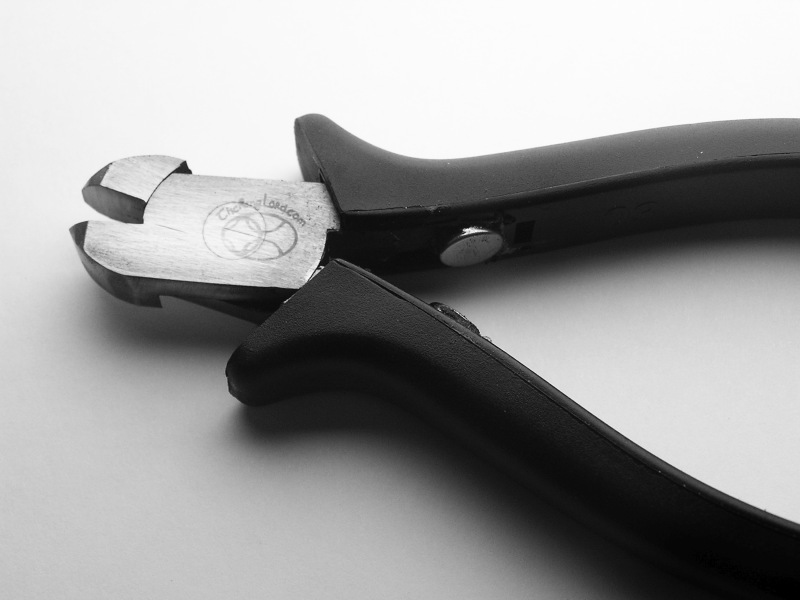 My Joshua Diliberto rare earth magnet pliers are indispensable, and great for my hand/arm health. Anyone who makes maille clothing or works with heavier gauges/tougher materials should own a pair. I do! I tend to listen to audiobooks, because I’m always behind on my personal reading goals. Music-wise I listen to gothic and industrial music while working—the sub-genres and moods within both are diverse, complex, and ever-evolving. If I’m solving a design issue well into the night, I especially like to listen to shoegaze and darkwave because of the rich soundscapes. If I need to get through a big order in a short amount of time, Wax Trax-era industrial will do the trick. I consistently return to the Cocteau Twins and Faun for nighttime creative bursts, and Frontline Assembly or Skinny Puppy for deadlines. Drab Majesty is a relatively recent favorite. What are your favorite artists (chainmaille or otherwise)? It would be hard for me to pick favorite creators within the chainmaille community—there are a lot of talented artists with distinctive and recognizable personal style. To me, if I can look at a piece and say, “Oh ___ made that,” then that person is a successful artist—they have a signature style. 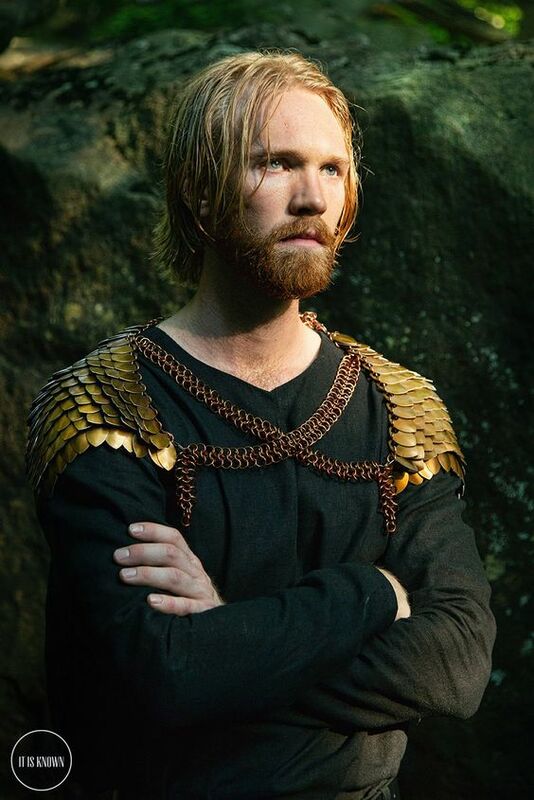 That being said, I’m a fan of Dr. T., Stephen Hoffman, Sunshyne of Chainmail & More, (previously Sblades) and Lord Randolph of Chainmail Fashions because of the work each has done with large-format chainmaille and chainmaille clothing. 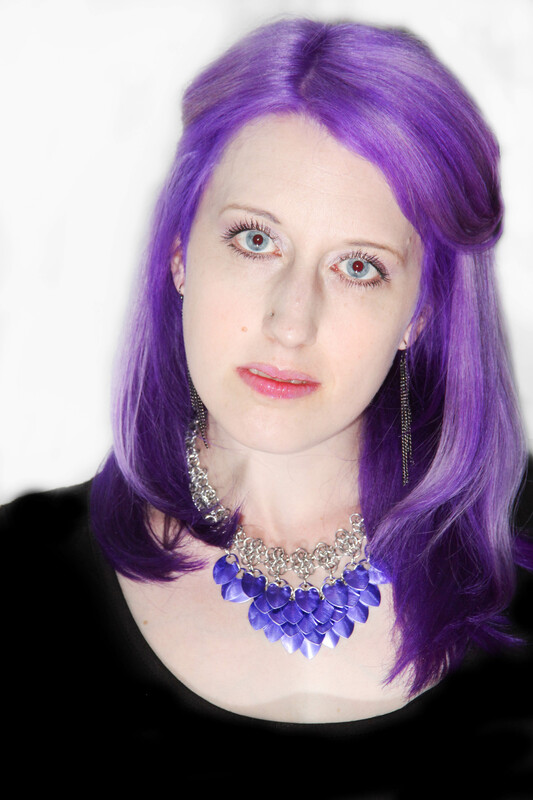 If it’s not too on the nose to compliment the person interviewing me, I’ve always admired your work (Rebeca Mojica Jewelry) for its adventurous use of color and the impeccable documentation of your tutorials! Awww. *blushes* Thank you so much! What do you do when you’re not making chainmaille? When I’m not making chainmaille I’m at the gym, doing creative direction for photoshoots, traveling, or attending local goth and industrial events..
Business-wise, the best advice I was ever given was to control “optional” overhead costs in the growth stages of a business—worry about creating beautiful and high-quality products, customer service, etc before you worry about renting out a corner office (or even printing business cards). I’ve applied that lean growth philosophy to every stage of my business so far, and it’s served me well. I love to weight train and I’m a lifelong athlete! Before we let you go, please tell us where we can find your work! You can find It Is Known in person in NYC at Gothic Renaissance. Our seasonal suppliers change and are listed on the It Is Known website. Thanks so much for taking the time to chat with us, Sally! I really enjoyed learning about your success and I loved geeking out with you in person! The artists behind Rebeca Mojica Jewelry and It Is Known. Photo by Austin Hill. And thank you, readers and fans of this series. While you’re here, be sure to check out the previous “Meet an Artist” posts: http://www.bluebuddhaboutique.com/blog/category/ask-an-artist-series/ and let me know if there’s anyone you want to see interviewed and any questions you have for them. ‘Til next time, happy crafting!